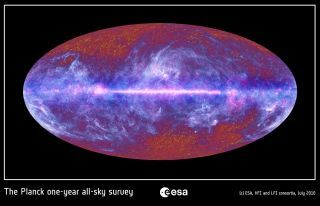 This all-sky image of the cosmic microwave background, created by the European Space Agency's Planck satellite, shows echoes of the Big Bang left over from the dawn of the universe. The first scientific results from the European Space Agency's Planck mission reveal new clues about how the universe began – including never-before-seen distant galaxy clusters and echoes of the Big Bang. The spacecraft's initial surveys of the entire sky produced a vast catalog of new data released this week. The Planck observatory, a telescope and a collection of instruments racing around the Earth aboard a satellite, found thousands of new dusty cocoons where stars are forming, as well as some of the most massive clusters of galaxies ever observed. The mission is aimed at taking some of the most detailed data yet on the cosmic microwave background, a relic of the Big Bang's explosion — which, 13.7 billion years on, still hangs around the universe as a pocked veil of radiation. By studying the fluctuations in the cosmic microwave background, researchers hope to answer fundamental questions about the origin and evolution of the universe, including what main ingredients were present at its fiery beginnings. Planck takes measurements at wavelengths between the infrared and radio — not in visible light — that reveal an otherwise invisible population of galaxies shrouded in dust, billions of years in the past. These cloaked galaxies formed stars at astonishing rates, some 10 to 1,000 times higher than we see in our own galaxy today, and are some of the coldest places in the universe. "This is a first step, we are just learning how to work with these data and extract the most information," said Jean-Loup Puget of the National Center for Scientific Research in France, a principal investigator on the Planck mission, which was launched in 2009. This map illustrates the numerous star-forming clouds, called cold cores, that Planck observed throughout our Milky Way galaxy. Planck, a European Space Agency mission with significant NASA participation, detected around 10,000 of these cores, thousands of which had never been seen before. Planck's new catalog includes some of the coldest of these dusty star nurseries ever seen, with temperatures as low as seven degrees above absolute zero. The new catalog also contains some of the most massive clusters of galaxies known, including a handful of newfound ones. The most massive of these holds the equivalent of a million billion suns' worth of mass, making it one of the most massive objects known. "The data we're releasing now are from what lies between us and the cosmic microwave background," said Charles Lawrence, the U.S. project scientist for Planck at NASA's Jet Propulsion Laboratory in Pasadena, Calif.
As yet, scientists can't see beyond the cosmic microwave background, which blocks the first 380,000 years of the universe from view. However, scientists hope that Planck can eventually look beyond this veil to the formation of the first large-scale structures in the universe, and the new findings indicate researchers have made progress toward that goal. Data indicate that the material obscuring the universe's birth pangs are dust grains, spinning at tens of billions of times per second, most likely set in motion by collisions with either fast-moving atoms or packets of ultraviolet light. "Today's results are the tip of the scientific iceberg," said David Southwood, ESA Director of Science and Robotic Exploration. "Beyond those announced today, this catalog contains the raw material for many more discoveries." Planck continues to survey the universe. Its next data release is scheduled for January 2013.